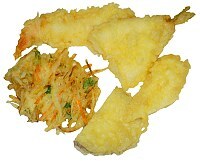 Tempura was brought to Japan by the Potuguese. Today Tempura is a very popular Japanese food, and as well one of the best known outside of Japan. and much more to try. * This ingredient may not be available in Western supermarkets, but you should be able to find it in Japanese grocery stores that exist in most large European and American cities. Prawn: Remove the head and the shell. Make little cuts on the inside of the curved prawn since they look nicer if their posture is straight. Cut the vegetables in about 1cm thick pieces. You can use whole mushrooms. Mixtures: Cut various ingredients in small pieces and mix them together, eg. green onion, prawn and carots. Mix Tempura flour with the amount of water described on the package. Do not mix it completely, but leave some small lumps in it. Cover all the ingredients completely with the batter. Mix also the mixtures made of the small cut ingredients with batter, and try to deep fry it together. Don't let them fall apart in all the pieces. Deep fry at 180 degrees celsius. Be careful, and do not use wet ingredients because the water would react strongly with the hot oil, which may harm your skin or eyes. When the Tempura pieces are beautifully golden, take them out, and try to remove as much oil as possible. Serve the Tempura pieces on a plate, and prepare some bowls with Tempura dipping sauce.